This study assesses the trend and patterns of climate variability on the Hadejia-Nguru Wetland. The major sources of the climatic data were collected from Nguru Meteorological station and Ministry of Agriculture in Nguru, Yobe State. The climatic data include Maximum and Minimum temperature and rainfall for the period of 42 years (1970-2011) was collected. Time series analysis using linear trend model was used to analyze the data. The climatic results revealed changes in the climatic parameters especially in rainfall and maximum and minimum temperatures. It revealed that there was a little per unit increase in the mean annual maximum temperature which increased by 2.40?C when the time is at origin (initial time), and the mean of mean annual maximum temperature was 34.3?C. It also shows the per unit increase in the mean minimum temperature which increased by 4.33?C when the time is at origin (initial time), the mean annual minimum temperature was 19.4?C. Furthermore, it indicated that the per unit increase in years of the mean annual rainfall increased by 1.00mm, when the time is at origin, the mean of mean of annual rainfall was 32.8mm. As a result of decline in rainfall with continued increase in population, there has been more pressure exerted on the wetland resources. The implication of the climatic variation had greatly impacted on the environmental conditions of the region. This study therefore recommends the Management of the Hadejia Jama’are Komadugu Yobe Basin Trust Fund to put in place empowerment strategies for mitigating the current pressure exerted on the wetlands for sustainable livelihood. 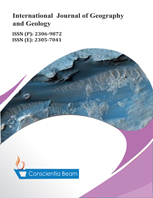 This study contributes in the existing literatures and used estimation method for assessment of climate variation. It’s one of the very few studies which investigated the influence of climate variability in the area. The primary contribution has revealed climate variation. It documents mitigation strategies for sustainability livelihood. Climate change, Climate variability, Temperature, Rainfall, Wetlands, Hadejia-Nguru. Bates, B.C., Z.W. Kundzewicz, S. Wu and J.P. Palutikof, 2008. Climate change and water. Technical Paper of the Intergovernmental Panel on Climate Change, IPCC Secretariat, Geneva: 210. Bawden, M.G., D.M. Carroll and P. Tuley, 1972. The land systems. In: Aitcheson P. J., Bawden M.G., Carroll D.M., Glover P.E., Klinkenberg K., de Leeuw P.N. and Tuley P.(Eds), The land resources of North East Nigeria. Tolwarth, Survey: Land Resources Division, 3. Enger, E.D. and Smith, 2006. Environmental science. A study of interrelationships. 10th Edn. New York: The Mc Gram-Hill Companies. pp: 405. HNWCP, 1997. Dynamic of livelihood system and the resources base in the Hadejia-Nguru Wetlands. Submission to the renewable natural resources (RNR). Sector Coordinator of the United Kingdom, Development (DFID) Kaduna by HNWCP-Nguru, July 1997. Inuwa, K.B., 2016. Assessment of landuse and landcover change in Nguru Part of Hadejia-Nguru Wetlands, Yobe State, Nigeria. M.Sc Thesis, Department of Geography, Unimaid, Nigeria. pp: 1-98. IPCC, 2001. Climate change 2001 Impacts adaptation and vulnerability chapters. Contribution of Working Group to the 3rd Assessment Report of the IPCC. pp: 10,11,17 and 18. IPCC, 2007. Climate change 2007 The physical science basis. Contribution of working group 1 to the fourth assessment report of the Intergovernmental panel on Climate Change [Solomon, S., D. Qin, M Manning, Z. Chen, M .Marquis, K.B Averyt, M.Tignor and H.L.Miller (Eds.)] Cambridge. United Kingdom and New York, USA: Cambridge University Press. Ravens, H.P., 1998. Environmental science. 2nd Edn., London: Saunders College Publishers. Schultz, 1976. Hadejia River Basin study. Canadian International Development Agency Interim Report, Canada, 6: 1-8. ( 12 ) Did Global Warming and Climate Change Cause the Degradation of Lake Chad, Africa's Most Important 'Ecological Catastrophe'?